I’ve read some great horror stories this year, two of which really stood out – Nod by Adrian Barnes and A Head Full of Ghosts by Paul Tremblay. Though very different both were psychological thrillers that picked away at the fabric of reality, personality and what grounds us in truth. Pleasingly, the shock and terror of each novel was produced alongside excellent writing and superb characters, making them both very memeorable books. 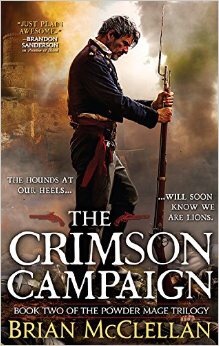 The Grace of Kings by Ken Liu was one of my top fantasy novel reads, in close contention with Brian McClellan’s The Crimson Campaign. A brilliant setting made even more enjoyable by the distinct and well defined protagonists, The Grace of Kings managed to mix political intrigue, epic battles and an original, atmospheric world. It’s quality fantasy in every sense. When it comes to top notch, awesome fantasy, Joe Abercrombie consistently serves up some of the very best. His short story collection, Sharp Ends, set in his First Law universe was, without a doubt, sheer brilliance. New characters were introduced, older actors had their origin stories told and the whole world he’s built is weaved together with exceptional skill. Hugely enjoyable, Sharp Ends is a big, bold barnburner. Whilst I admit I’m a fan of action, adventure and gritty battle based fiction, I’ve had the chance to read some intelligent and mindful science fiction this year. Savant by Vik Abnett epitomised that. Unique worldbuilding, a slightly retro yet original tone and an engaging story revolving around mathematics and companionship, this was a standout novel in my year. Featuring a very different yet equally enthralling maths based concept, Yoon Ha Lee’s Ninefox Gambit is an amazing novel. Distinctive and innovative, Yoon Ha Lee’s inspired setting brings a new vibe to sci-fi. As I said in my review, ‘It’s a stunning piece of creativity that melds futuristic ideas of technology and the feel of an epic space opera with the ephemeral and magical vibe of pure fantasy’. Finally, the self-published novel from Malcolm F Cross, Dog Country, proved to be another highlight. A thought provoking look at geo-political warfare, Dog Country is a brilliantly written piece of military sci-fi. Genetically modified, humanoid, dog soldiers fighting in a crowdfunded revolution whilst, simultaneously, trying to find their place in a society that created yet rejected them. Great characters, a clever concept and an even better plot. I’ve also watched a few decent films but hats off to Mad Max:Fury Road. Though time has been a precious commodity this year (my wife and I still haven’t started season 7 of TWD) I did manage to catch Westworld and the sixth series of The Walking Dead – I will have some posts on that very soon. I’m whittling my way through my reading pile and have some interesting books lined up. It’s been a good year for reading and I’m looking forward to more reviews and interviews. 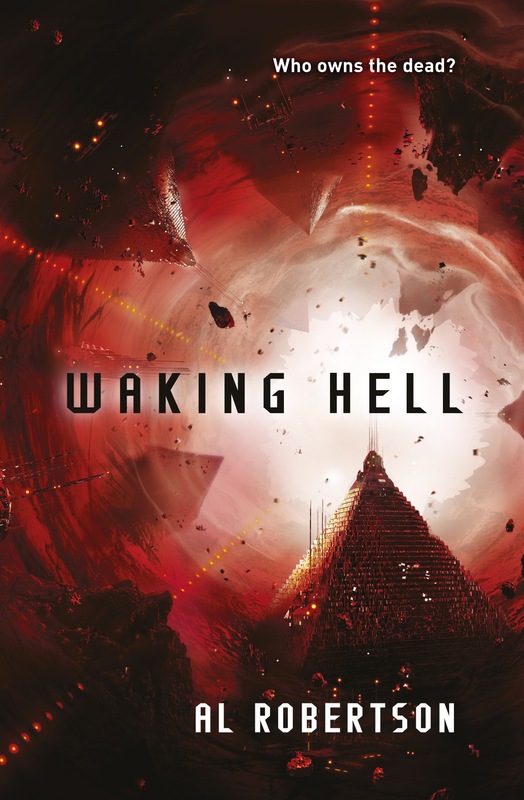 Returning with a sequel to Crashing Heaven, Al Robertson takes us deeper into his post-Earth ‘world’ with Waking Hell. Exploring the city of Station through the perspective of Leila, years after the events of Crashing Heaven, notions of digital past-life humanity, organic AI civillization and the importance of memory create a fascinating backdrop to the main plot. Dieter, Leila’s brother, is both a talented programmer and a historical buff. But, he’s just been killed and, in the process, has somehow signed a deal that makes his sister extremely rich. However, Leila is a ‘fetch’; a digital personality made real via the virtual weave that pervades Station. Instantly the deal seems dodgy and Leila quickly discovers that Dieter has signed over his life – real, virtual and everything inbetween. If the money was worrying enough, losing his ability to return as a fetch is totally perplexing. Setting out to find the truth, Leila finds both powerful allies and deadly enemies in abundance. The truth she uncovers is, indeed, truly frightening. Yet, through all of this, including some exceptionally cool examination of Station, it is the idea of memory that is so important. Memory both as personality and as signifier for the future self. When weapons can attack that data, rewrite the mind, memory becomes a vital commodity. Waking Hell has its explosive moments but it is a considered and considerate observation into this idea of the mind. Leila as both a fetch and investigator is constantly caught up in memories and trying to untangle the past from the faked. Al Robertson delivers on worldbuilding once again, letting us go further and deeper into Station, the Totality, the Pantheon and its history. The complex weave of organic AI, virtual entities and post-human civillization is brilliant and this is another great story set in its cyberpunk-esque world. This is quite a difficult book to review, mainly for fear of giving away what makes it so brutal. By that, I mean psychologically brutal because, whilst there is some physical shock value, it’s the emotional terror pervading the novel that makes it so horrifying. Yet, it’s also a complex piece of work, full of dual meanings and self-aware references all told by an unreliable narrator. Her unreliability is cleverly revealed to be more of a factor as the book goes on…and this is where things get complicated. If you’re a fan of horror, you should read this novel. In my limited experience, Paul Tremblay is a great exponent of the genre but, beyond that, he’s also a clearly talented writer. This is a very smart book for a number of reasons (many of which deserve discussion but – spoilers!). 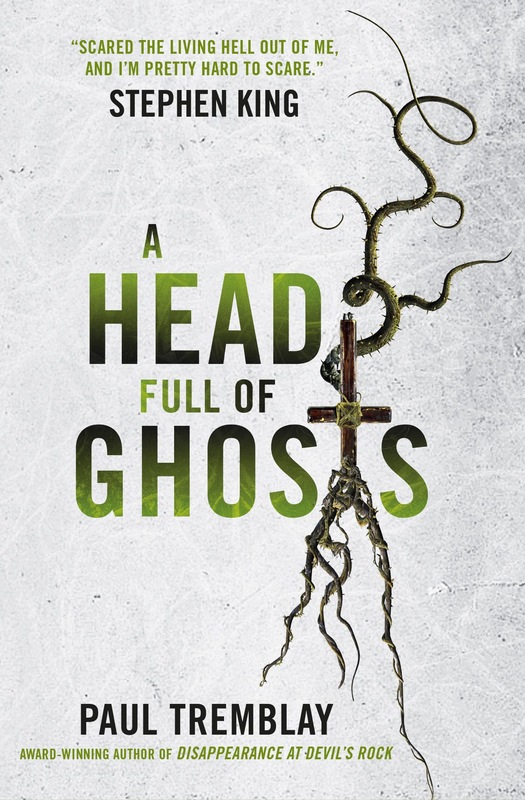 A Head Full of Ghosts refers both to the idea of supernatural possession central to the plot but also to our narrator, Merry, and how pop culture affects her perspective. Within the book there are numerous references to horror fiction and film and A Head Full of Ghosts takes on the sense of a meta-fiction. The book explores how Merry and her family deal with the ‘apparent’ possession of her elder sister Marjorie. Dad had lost his job and begins to rely heavily on his Catholic faith; Mum seems at a loss, seeking solace in wine and cigarettes. Merry is relating all of this fifteen years after the fact (the first sense of unreliability) and was only 8-years old at the time (the second). Somehow, and for financial reasons, a reality show producer makes an unrefusable offer to the floundering parents and so begins a shocking TV series. Questions of exploitation aside, there is also the larger problem of whether 14-year old Marjorie is ‘possessed’ or just descending into schizophrenic madness. The interplay within the narration between memory and re-remembered fact from the TV show (the third idea of unreliability) begins to break to the surface as Merry relates her story to a writer tasked with producing a book on what actually happened. Fact and fiction blur, mingled with cultural references and other creative works. The tension at play is palpable throughout the novel as each family member is seen slowly unraveling under the pressure of the cameras, their own position toward Marjorie and to how it is affecting each in turn. It’s a bizarre and scary feedback loop where the truth has no solid ground on which to stand. The conclusion of A Head Full of Ghosts is shocking. It’s there all the time, creeping around in the narrative and you know something is going to happen. There’s so many unsettling properties to the characters and such clever storytelling that this is truly a great horror novel. That fact that Paul Tremblay has added bonus essays and reading list addendum only makes him a better author in my opinion. Nik Abnett, author of the excellent Savant was kind enough to answer some questions about her latest novel. Savant is a unique book – could you explain a little about how it came to be? NIK: I’d had in mind for a long time to write a book about unconditional love; the sort of constant you find between parents and their children. I didn’t want to write something righteous or proselytising, though, and that’s part of the reason I thought that the SF medium would best suit the theme. Then, I happened to start reading a novel by a friend of mine. I’d bought the book, and got it signed, but when I came to read it, it simply wasn’t my cup of tea. I realised that a lot of contemporary SF leaves me a little cold; much of it seems to be so busy and action-based, and I wanted to read something quieter. It dawned on me that I wanted to write something quieter, too. SF/F is a brilliant medium for all kinds of ideas, because the scope is so endless. Of course, in the end, and in development, the book became about all kinds of things, but it began with that nugget, and I extrapolated as I went along. The original theme may not be transparent in the finished novel, but it’s the kernel from which everything began. In essence, it came to be, because I wanted to write something that I’d enjoy reading. The setting struck me as retro-sci-fi (like some of those great 1970’s movies) – what was the thinking behind this kind of worldbuilding? NIK: I’m a child of the seventies, and some of my favourite SF still comes from that period. As children, we are at our most receptive and least inhibited, and I think the stories we read or watch often have the biggest impact on us during that developmental period. I’m not sure I thought about the world-building in isolation. I begin a novel with only a theme to work with, so plot, action and world-building are all a product of the process of writing the book. Much of the world came as an organic response to the characters and situation. Perhaps it’s partly due to the fact that I was at school during the seventies and early eighties, and this novel is set in a college environment. Perhaps it was inevitable that the world-building might, in some small way, reflect my own experiences of that kind of institutionalisation… I could speculate endlessly. Using a savant, Tobe, as one of your main characters is an interesting choice – especially considering his relationship to Metoo – how challenging was that to write and what inspired that choice? NIK: It’s always interesting to try to represent characters that are in some way ‘other’. Every time a male author writes a female character, or a woman writer a male character, the same thing applies. I’m not a soldier, a monster, an alien, a man or a child, either, I’m a writer, but it would soon become very dull to write about writers and writing. We give little thought to how otherness is represented until it falls within the spectrum of people who are otherwise very like us. We take much for granted. Readers are less likely to take human others for granted, because we all have a social interest in their welfare, and, sometimes, a fascination with their conditions. I guess the choice of writing Tobe and Metoo was about the line between the intellectual and the emotional. These two characters are simply at either ends of this spectrum of human experience. Some are more intellectual than emotional, and some the other way around. Tobe and Metoo both represent extreme personalities in their different ways. Was it challenging to write? I guess no more challenging than any kind of ‘other’, and the relationship between these two characters helped enormously. When I was in any doubt, I gave Metoo an emotional, but measured response, while Tobe tended to the intellectual, but irrational. Once I got the rhythm, these two were great fun to write. Your novel also considers the notion of a political state (a very controlling one); what was the idea behind ‘Service’? NIK: Initially, Service was simply a mechanism to give Tobe routines; order was key to his welfare. Of course, during the writing of the book, it became much more than that. Tobe’s disintegration into chaos is at the heart of this novel, and it had to be massively dangerous in order to set-up Metoo as his opposite, and for her to fulfil her role. What is more dangerous to the individual than the interference of the state? I toyed a lot with the idea of the State as a controlling factor in my characters’ lives. Everything, as they say, is political. All of our lives are determined by the political decisions and machinations of our leaders, elected or otherwise. Service made the State not only visibly controlling, but it also gave the State a number of faces and personalities. In contrast to that idea of total control (and spiralling paranoia) is a sense of empathy both from Metoo and certain members of ‘service’ which produces an interesting dichotomy – was that your first intention? NIK: This was always going to be a novel about people, and essentially character driven. For that to be the case, I think characters always have to be empathic, or at the very least sympathetic. It’s possible to put any amount of data into a computer and come up with an answer, but that answer will never take personalities into account. For Service to feel real, and for the State to have any genuine impact on the story, it all had to be represented by fallible, feeling characters. I was also enamoured with the action in Savant – the work stations and surveillance of ‘service’; compared to something like Fiefdom, how hard was it to create that kind of tension and atmosphere? NIK: The tension was all there in my head, once I’d worked out what the novel was going to try to do. Getting that tension onto the page takes a certain amount of disciple to ensure a good build-up. There are a few simple tricks to that in the writing. Repetition is important, and rhythm. A good example can be found in Ravel’s Bolero with its repeated phrasing and increasing tempo. I think it’s also useful to be quite declarative on the page, matter-of-fact; obfuscation pulls focus. The other thing is pacing. Often, writers want to go faster, take shortcuts as the tension builds. I think it’s more useful to add detail, to slow things down, from time to time, to keep the reader hanging, so that the denouement is reached naturally and the story isn’t all over in a rush. 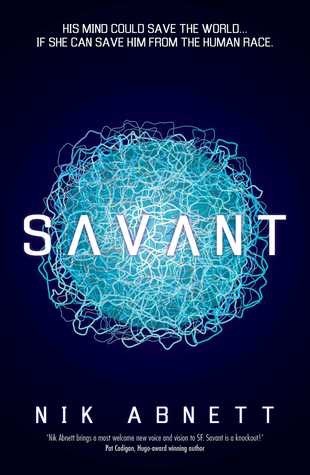 There’s a fantastic positivity and humanity at the heart of Savant – what can we expect from next? NIK: Thanks. I’m glad you think so… I thought so too. I’ve actually begun writing a companion piece to Savant, working title Seekers. It’s set in space on the other side of the shield, so there’s a chance to find out what the threat to the Earth might actually have been. I didn’t tackle space, spacecraft or aliens in Savant, so it’s a chance to do something about that, although, don’t hold your breath for a more convention shooty-death-kill-in-space experience. Obelisk, a short story taking the name of this collection, is a fascinating tale considering the efforts of colonisation on Mars. Whilst the practicalities of such an endeavour are always at the forefront, it is the people behind them, managing, pushing, exploring the limits which makes for success and failure. In Obelisk, the relationship between former pilot Wei Binglin and disgraced entrepreneur Bill Kendrick explores what cost progress asks. Both are seeking a form of redemption and yet both get caught in persuing growth, advancements and success. A thoughtful essay both for its backstory of Mars’ colonies and for its reflection of the pioneer spirit. The next story, Escape from Eden, similarly deliberates on a kind of pioneering spirit but from the opposite side. And, again, partially fills in some backstory – this time for Yuri, one of the protagonists from Proxima. A young man, put in cyrogenic stasis for a century and awoken on Mars, Yuri is not a voluntary colonial. Trapped and bereft of any ties to his place and time, Yuri is a great lens through which we can see just how strange and alien this future has become. This is a great anthology of work, one I’ll definitely return to. However, I’ve got a reading pile I’m excited to work through plus The walking Dead season 7 to catch up with and the new TV seriesWestworld to continue watching, so expect more rambling reviews soon. 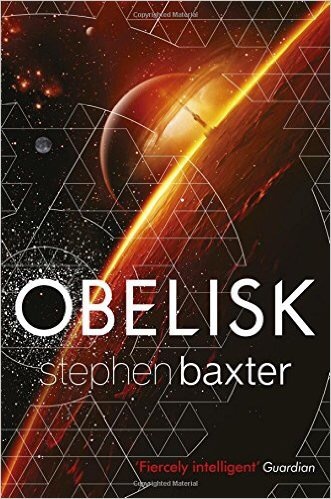 A collection of short stories set in Stephen Baxter’s Ultima and Proxima novels, along with other works, Obelisk is testament to the author’s prowess. I read Proxima not so long ago and so I was eager to jump in to the related short fiction presented in this book. On Chryse Plain is like a piece of impressive flash art; a self-contained, expressive snap shot of life (produced in Baxter’s universe). Two young Martian settlers are going about their duties, discussing the elder’s imminent arranged marriage. A tourist from Earth crashes into them, causing all three to be stranded out in the dusty plains of Mars. A story of survival that actually focuses on the relationships between these human, yet alien, characters, On Chryse Plain is a clever look at the wider world building at play. From that very human story, the next in the collection is a frightening imagining of the very alien consciousness of Artificial Intelligence. As Earth struggles under the weight of climate collapse, the emerged AIs have shown just how far from human concerns they are, physically, intellectually and in terms of time scales. Resurrected from data sources, former cop Philimus is tasked with trying to converse with Earthshine, the smallest of the AIs. Accompanied by a Vatican priest, Philimus must engage in both the real and virtual in an attempt to uncover the meaning behind some data clue. It’s a terrifying encounter. In A Journey to Amasia, Stephen Baxter touches not only on a dark future of climate change and resource scarcity but also the very alien and different nature of artificial intelligence. A brilliant and considered story.